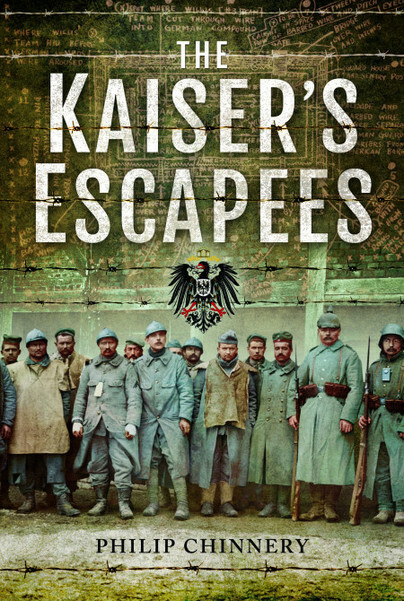 You'll be £19.99 closer to your next £10.00 credit when you purchase The Kaiser's Escapees. What's this? Following on from his first well-received book 'The Kaisers First POWs' Philip Chinnery now turns his attention to the attempts by allied prisoners of war to escape the Kaiser's clutches and return to their homeland. As the war progressed, the treatment of allied prisoners worsened as the blockade of Germany reduced the amount of food and material coming into the country. The majority of the prisoners were too weak or ill-equipped to attempt to escape, but there were others who were determined to pit their wits against their jailers. These included the officers at Holzminden prison, who dug a tunnel allowing twenty-eight of their number to escape; men like Canadian Private Simmons, who escaped and was recaptured twice before his third attempt saw him gain his freedom; men who jumped from moving trains or marched brazenly out of the camp gates disguised as German officers. Although Holland and Switzerland were neutral countries during the First World War, escaping from their camps, crossing miles of enemy territory and outwitting the sentries guarding the frontiers taxed even the strongest individuals. But many men did make the attempt and more than a few of them were successful. This is their story.